Andy's Forum > Categories > ALTERNATIVE HEALTH > ARE YOU WORRIED ABOUT A MASSIVE EBOLA PANDEMIC OUTBREAK? NO WORRIES..READ THIS!!! ARE YOU WORRIED ABOUT A MASSIVE EBOLA PANDEMIC OUTBREAK? 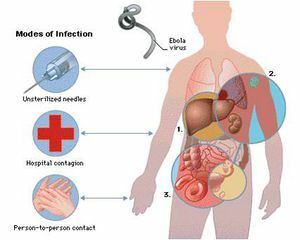 Ebola virus disease (EVD) or Ebola hemorrhagic fever (EHF) is the human disease caused by the ebola virus. Symptoms typically start two days to three weeks after contracting the virus, with a fever, throat and muscle pains, and headaches. There is then typically nausea, vomiting, and diarrhea, along with decreased functioning of the liver and kidneys. At this point, some people begin to have problems with bleeding. OK, FIRST OF ALL, DO NOT GET ANY SHOTS OR VACCINES FOR THIS AND/OR ANY OTHER DISEASE OR AILMENT FOR YOURSELF OR YOUR LOVED ONES SINCE IT WILL NOT HELP AND MAY EVEN HURT YOU INSTEAD. WHAT WE MUST DO IS GO TO http://www.MESOSILVER.COM AND BUY THEIR MESOSILVER COLLOIDAL SILVER. I WROTE A POST ON IT AT DOES COLLOIDAL SILVER BLOCK THE HIV VIRUS? MERS? YES, IT DOES!!! WHEN COLLOIDAL SILVER HAS SILVER PARTICLES SMALLER THAN .80 NM'S (LIKE MESOSILVER DOES WITH .65 NM'S IN SILVER PARTICLE SIZE), THEY BLOCK ALL VIRUSES AND PATHOGENS. I RECOMMEND TAKING MESOSILVER ONCE A DAY FOR TWO WEEKS AND THEN AFTER THAT TWICE A WEEK. I GUARANTEE YOU WILL NEVER HAVE A FEVER AGAIN AND YOU WILL BE FREE FROM HIV, SARS, EBOLA, WEST NILE, ETC, ETC. THE MEDICAL COMMUNITY HATES COLLOIDAL SILVER WITH A PASSION AND WILL DO EVERYTHING THEY CAN TO MAKE SURE YOU STAY AWAY FROM IT BECAUSE BASICALLY IT CAN PUT THEM OUT OF BUSINESS IF EVERYONE STARTED TAKING IT. WHAT PEOPLE DON'T KNOW IS THAT BAYER HAS A PATENT FROM OVER 50 YEARS AGO TO USE COLLOIDAL SILVER TO TREAT SYPHILIS. THE ONLY THING WAS THEY DID NOT HAVE THE TECHNOLOGY BACK THEN TO MAKE THE SILVER PARTICLES SMALL ENOUGH TO BE FULLY EFFECTIVE. LASTLY, NO WORRIES!!! YOU NOW HAVE THE KNOWLEDGE TO PROTECT YOURSELF AND YOUR LOVED ONES FROM THE EBOLA VIRUS AND OTHER "BUGS". ALL YOU HAVE TO DO IS FOLLOW THROUGH AND STAY STRONG SO THAT THE MEDICAL INDUSTRY DOES NOT DUPE YOU INTO CHANGING YOUR MIND BACK TO VACCINES.